WATER celebrates the wonderful life and mourns the passing of Ada Maria Isasi-Diaz. Ada was a longtime compañera in the struggles for justice for women and all who are oppressed. 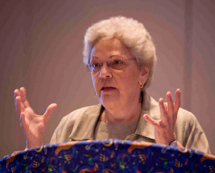 She was an early staff person for the Women’s Ordination Conference and a stalwart supporter of women’s theological and ministerial empowerment. Her autobiographical remarks can be found here. Dr. Isasi-Diaz taught for more than twenty years at the Theological and Graduate Schools of Drew University where she focused on theology and ethics. Among her best-known publications are Mujerista Theology, En la Lucha, and La Lucha Continues. At the time of her death, she was completing a book on compassion, a good word to sum up her active and generous life. Ada was a highly regarded intellectual, a professor, and scholar. As an exile from Cuba, she knew the rigors of immigrant life and the importance of family and community to sustain one along the journey. So her theological work was always tested and molded in the context of an extended group of women and men with whom she made sense of lo cotidiano (everyday life) and engaged in la lucha (struggle). Her untimely death leaves a large void in the field of mujerista theology that she developed in her active and productive life. WATER extends deep sympathy to her family and friends, to the community at Drew University, and to the many people whose lives have been enriched by this committed compañera.